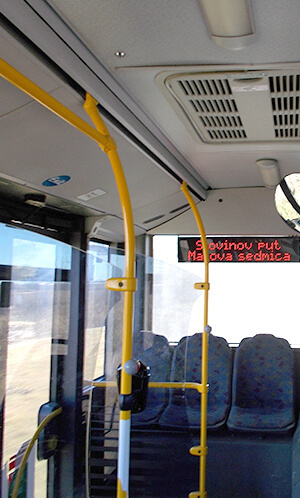 Bus displays are displays that are placed on the bus and there are two types of displays: internal and external display. Bus inner info display shows where the bus station is currently located as to where the next stop is going. Bus info external display shows the name and line number. 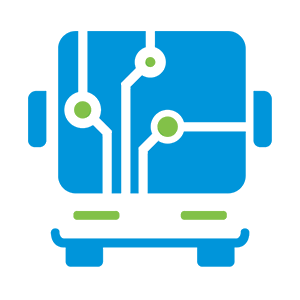 All data displayed are taken from BusLogic Ticketing System and the line itself is automatically displayed based on the line that opens by driver on the device that is usedfor ticket sales - BusLogic Cash Terminal. BusLogic displays are made in LED technology with a very clear presentation of content used LEDs - High durability and minimal consumption. The displays are built in a rugged package of universal design and, as such, fit into any environment in which they can be used. LED Display Amber (yellow) color. Power consumption: 25W max, depending on the external light. Operating temperature: -20 ° C ~ +70 ° C.
Storage temperature: -25 ° C ~ +80 ° C.
Resolution of 28 x 16 points with spacing of 10mm between points. Automatic brightness control based on ambiental lights. Internal SPI Flash memory for storing text and images (adds). Wire compatibility with BusLogic hub and BL GPS / GPRS modem via RS485. Wireless compatibility with BusLogic terminal via a 433MHz RF..
rmware over cable (RS232 or RS485. rmware over the air via a 433MHz RF. Display dimensions 990mm x 300mm.